I had two agendas that day so I need to wear something for both. There’s Bloggers United 4 during the day and a family dinner at night. When I dress up, I usually pick one thing I have to or you know, something I just want to use or wear and revolve my outfit around it. For the day, I have to bring my DSLR so I had to bring a bag where it would fit. But since I’m paranoid of it being snatched, my bag had to not look like it’s containing something important. 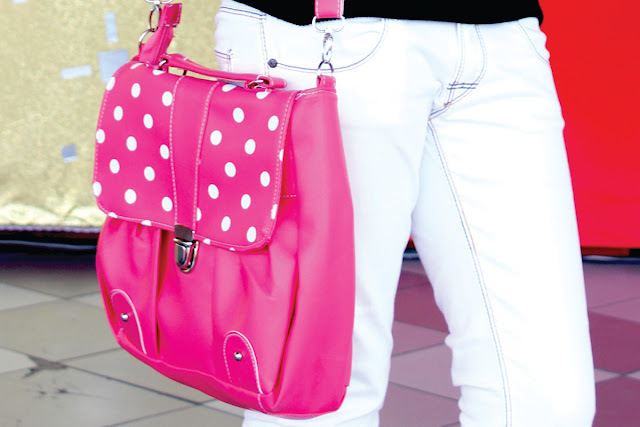 And the perfect one for the job is this pink bag. I love mixing neutrals+any color. This combination is such a no-brainer and works everytime, don't you think? So this is what I wore to BU4. In another blog post, I will show you the bloggers I met and my haul for the day. But for now, let me show you what I wore for our family dinner that night. We were going to Tagaytay so I knew it will be chilly. That's why I changed to a more appropriate top, a ¾ sleeved buttondown! I know it looks thin, it is. But I wore a comfortable tank inside for my body to feel warm. I’m relatively immune to coldness, unlike my family so I didn’t need a jacket. As long as my arms are covered, I’m fine! Unlike for my day outfit, I didn’t have to center my night outfit into my bag because I didn’t bring any. I could just wear my camera strap around my head because I was not going to commute.